The #KU_WWI Twitter Project never intended on being a strictly historical representation or chronological timeline of the events that occurred in Sarajevo on 28 June 1914. Rather, it proposed a more creative approach – a human-focused interdisciplinary perspective that included history but also had geographical, literary, music and other social science and humanities elements both past and present. In other words, it was intended to be a social media performance piece that might inspire followers to learn more about World War I history. But that doesn’t mean the project was entirely devoid of historical fact. In this blog post, we’ll deconstruct the #KU_WWI LIVE Tweetenactment and point out any interesting bits you might have missed on the day of the event. The #KU_WWI LIVE Tweetenactment began at 9:30 am, 100 years to the minute (not accounting for the time difference) that Archduke Franz Ferdinand and Duchess Sophie departed Hotel Bosna in Ilidze for their official visit to Sarajevo. The morning begins with reference to the previous mini tweetenactment #IheartBosnia that ends with an exchange in which the Archduke tries to cancel the next day’s visit and the Governor insists. This discussion between the Archduke and Governor Potiorek actually took place the night before the assassination when both were attending a celebratory dinner at Hotel Bosna. The morning of the assassination, the conspirators did in fact meet in a back room of Vlasjić’s Pastry Shop. There they received their weapons, and then identified strategic positions along the Miljacka River using a map of the parade route that had been published in local newspapers. For weapons, Gavrilo Princip chose to take a gun, Nedeljko Čabrinović took a bomb, and Trifko Grabež chose both – as indicated in the Tweetenactment. At Vlasjić’s Pastry Shop conspiracy organizer Danilo Ilić distributed cyanide capsules – rather than be apprehended, the assassins intended on taking their own lives. As audience members learned to great dramatic effect, the cyanide capsules were old and did not kill the assassins who swallowed them. Archduke Franz Ferdinand and Duchess Sophie were in the 3rd car in the motorcade. They rode in a Viennese Graf & Stift Bois de Boulogne open touring car that sported a yellow and black Hapsburg flag. A man named Leopold Loyka drove the car. As the motorcade moved along the parade route, most of the assassins failed to act. There is still some controversy as to why – some may have had second thoughts, some might have froze – a few claimed during their trial that they were being watched too closely by police stationed in the crowd. Whatever the reason, in the end, only Nedeljko Čabrinović and Gavrilo Princip went through with the assassination plan. The first assassination attempt on June 28th occurred when Nedeljko Čabrinović pulled out the bomb he’d received at Vlasjić’s Pastry Shop, struck its detonator cap against a lamppost, then hurled it at the Archduke. Seeing the bomb, driver Leopold Loyka quickly accelerated and Archduke Franz Ferdinand raised his arm in an effort to protect Duchess Sophie. The bomb bounced off the back of their car and exploded under the car behind them. The passengers in the Archduke’s car were relatively unhurt – Duchess Sophie did receive some minor injuries. The passengers of the 4th car as well as 20 spectators were injured by the explosion and taken to a local garrison hospital. After tossing the bomb, Nedeljko Čabrinović swallowed his cyanide capsule and shouted, “I am a Serbian hero” before leaping into the Miljacka River – which, because it was Bosnia in June, was only a few inches deep. He was quickly apprehended by police and taken away. And the awkward moment in which the flustered mayor continued to read his prepared speech to which Archduke Ferdinand replied by reading from the pages of his own prepared remarks visibly splattered with the blood of his aide is also a matter of historical fact. After the visit at city hall, it was agreed that instead of continuing with the official itinerary, the Archduke should visit those wounded by the earlier assassination attempt. Ironically, the person in charge of telling the driver of Archduke Ferdinand’s car about the change in destination was one of those injured in the bombing, and was therefore at the hospital unable to perform his duties. Gavrilo Princip, the only assassin still committed to seeing the plot through, had wandered down Appel Quay to the corner of Franz Josef Strasse and was loitering in front of Schiller’s Delicatessen. During his trial he confessed he was just wasting time after a long and disappointing day. He was sure that the motorcade would change the planned route, and was stunned when it continued along its original path and passed right in front of him. There is some controversy as to whether Archduke Ferdinand’s car stopped in front of Gavrilo Princip or actually backed up to him (did the car have a reverse gear?) – regardless, the assassin found himself less than 5 ft from his marks. 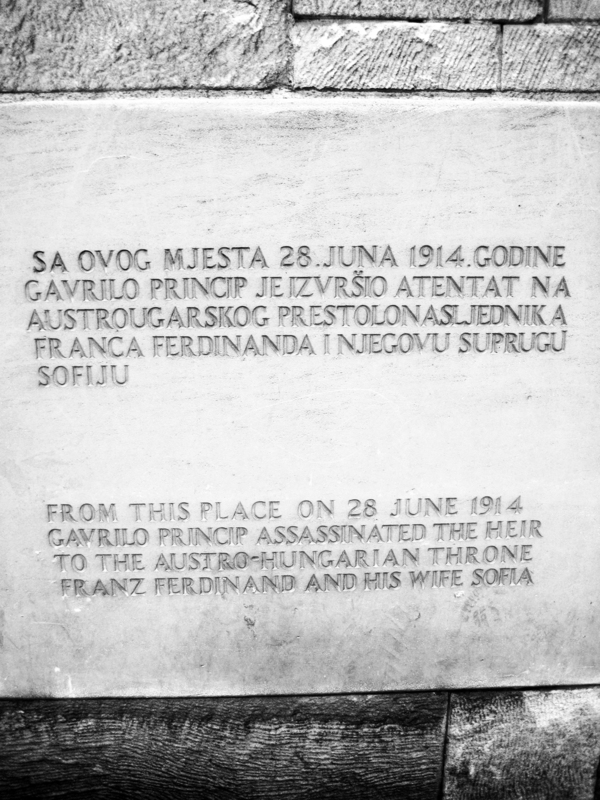 It is said that upon seeing Duchess Sophie, Gavrilo Princip hesitated for several seconds before discharging his weapon. At his trial, he insisted that her death was an accident and while his accounts deferred, at one point said he was so excited he could not recall how many times he fired the gun or even where he aimed. For the assassination, lyrics from the band Franz Ferdinand’s song, “All For You, Sofia” were used to illustrate the shooting. The juxtaposition highlights Gavrilo Princip’s youth – he was only 19-years-old at the time of the assassination and had he been alive today, might very well have liked this popular indie rock band. Using the modern day band’s lyrics in this context also educates fans that might not have fully understood the song’s historical context. The Storify for the LIVE Tweetenactment concludes with the deaths of Archduke Ferdinand and Duchess Sophie. For an epilogue, the Tweetenactment features eleven graphic representations of the assassination in what we call #AssassinationReimagined. This was followed by eleven newspaper headlines in different languages. Both illustrate how the world learned about the fateful events in Sarajevo that would eventually lead to global conflict. In the epilogue, the number eleven was specifically chosen for its symbolic significance in WWI history. 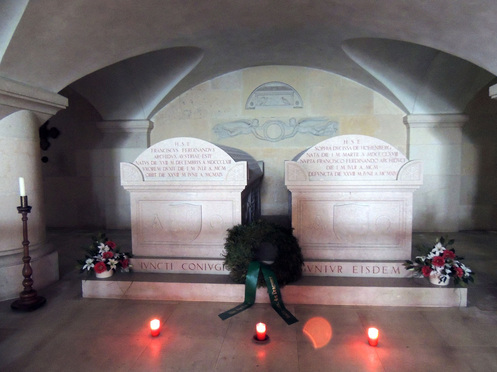 Last rites were said over the bodies of Archduke Ferdinand and Duchess Sophie at 11pm. The license plate of the car they were riding in when they died was “AIII 118” which some claim eerily prophesizes 11/11/18, the date of the WWI armistice at the eleventh hour of the eleventh day on the eleventh month in 1918. While this concluded the LIVE portion of the #KU_WWI Twitter Project, the tweets didn’t stop there. Over the next few days we will release the Storifies for what happened in Sarajevo following the assassination, how the world found out and reacted, what happened to Archduke Ferdinand and Duchess Sophie’s children, and the literary interpretation of these events. Click here to learn more about the #KU_WWI Twitter Project. Click here to read more about the characters. Christopher Clark, The Sleepwalkers: How Europe Went to War in 1914, (New York: Harper Collins, 2012). Greg King and Sue Woolmans, The Assassination of the Archduke: Sarajevo 1914 and the Romance that Changed the World, (New York: St. Martin’s Press, 2013). John Keegan, The First World War, ( New York: Vintage Books, 1998). Max Hastings, Catastrophe 1914: Europe Goes to War, ( New York: Knopf, 2013). Sean McMeekin, July 1914: Countdown to War, (New York: Basic Books, 2013). 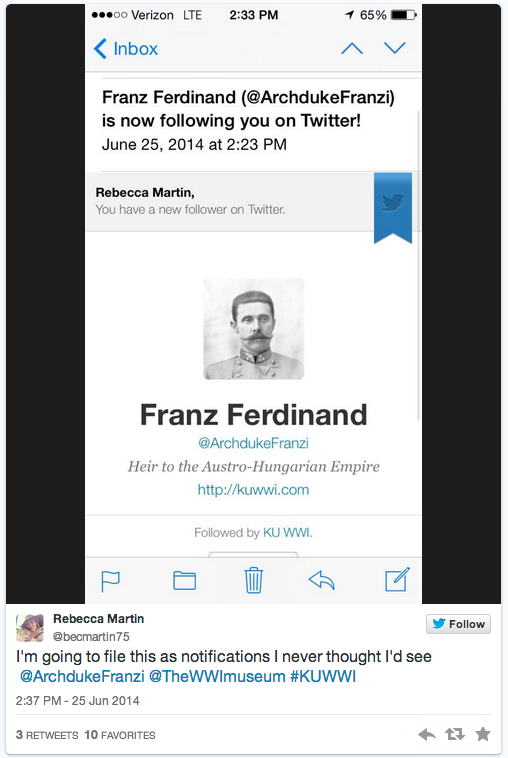 On 28 June 2014, #KU_WWI Twitter Project staff and 8 members from the Lawrence community met at the National World War I Museum at Liberty Memorial in Kansas City to LIVE Tweetenact the assassination of Archduke Franz Ferdinand exactly 100 years after his death. University of Kansas faculty, students, and members of the local community learned about the historical event and wrote many of the tweets for the reenactment during Spring 2014. These contributions were formed into a Master Script that was uploaded into an automated system that began tweeting out using the hashtag #KU_WWI at 9:30 am on June 28th, exactly 100 years to the minute (not counting the time difference) that Archduke Franz Ferdinand and his wife, Duchess Sophie, left Hotel Bosna to begin their fateful visit to Sarajevo. The 8 LIVE tweeters had advanced copies of this script, and were tasked with researching, adding, embellishing, explaining, retweeting and responding to the automated script in the voice of the character or characters they represented. The end result was, as one #KU_WWI staff member likes to describe it, a “historically-inspired, humanities-driven improvisational social media jazz piece” that gave voice, agency and narrative to the persons involved in this event often perceived as the starting point for a war that would result in the death of 17 million people. #KU_WWI Project staff would like to thank the National World War I Museum for hosting us on June 28th. And we would especially like to express our gratitude to the smart, witty, creative, history-loving and community-driven LIVE tweeters who took time out of their busy lives to research these events and share their unique perspectives. Thank you, tweeps! While the assassination occurred on June 28th, it wasn’t until one month later, on July 28th, 1914, that Austria-Hungary declared war on Serbia and the First World War officially began. In remembrance of this momentous day in history, #KU_WWI staff have waited until exactly 100 years later, 28 July 2014, to release the Storify of the LIVE Tweetenactment of the Assassination of Archduke Franz Ferdinand. The month long delay in releasing the LIVE Tweetenactment has somewhat disrupted the project’s historical timeline – the follow-up mini tweetenactments of what occurred in Sarajevo after the assassination, the reaction of leaders from around the world, and the experience of the couple’s children will be somewhat out of time and place when we release them in August. But we still felt the wait was symbolically worthwhile. As the WWI centennial commemoration progresses over the month of August and we learn more about how this conflict shaped the 20th century, we hope these #KU_WWI Storifies are small reminders of the human side of these events, and make us think back to what occurred just one month earlier in Sarajevo. May these events always be remembered, and the people never forgotten. 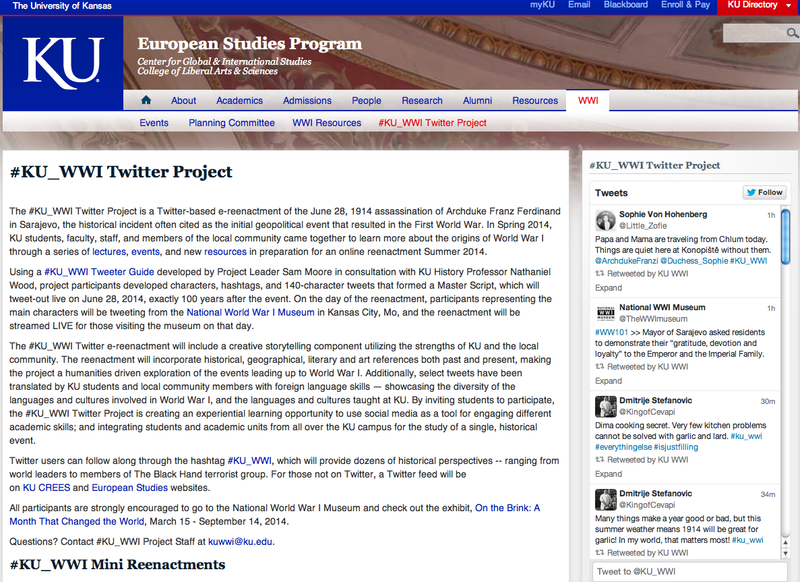 Click here to read about the #KU_WWI Twitter Project in the Washington Post. In #SafetyFirst, the governor of Bosnia and police commissioner of Sarajevo introduced audiences to security concerns in Sarajevo. #Conspiracy acquainted followers with the assassins and their plot, and #WhySarajevo explored the reasons for the Archduke’s visit to Bosnia. #All4USophie, one of the more popular mini tweetenactments, shared words written by the Archduke to his morganatic wife, Duchess Sophie – their romance arguably being one of the greatest in the 20th century. #BlankCheck illustrates how war between Serbia and Austria had been fomenting long before the assassination of the Archduke on June 28th. And #IheartBosnia features an ensemble of characters as they tweeted about their lives in the months, weeks, and days before the fateful summer day in 1914. The main characters in these mini tweetenactments were created by #KU_WWI staff. Each account took about 30 minutes to create, and in order to keep the accounts active, #KU_WWI staff had to regularly sign-in as each character and monitor their twitter accounts. In order to generate interest in the project, #KU_WWI staff made it a point of following each twitter account that followed @KU_WWI leading to some very funny responses. While building a following for the project, #KU_WWI staff also worked on developing the voice and perspective of each character using sources like Greg King and Sue Woolmans’ The Assassination of the Archduke and Christopher Clark’s The Sleepwalkers. We tried to humanize each character by adding personality quirks – for example, the #Conspiracy mini tweetenactment not only conveys a group of disenfranchised, radicalized youth but also illustrates the carefree and loose-lipped nature of assassin Nedeljko Čabrinović – an increasing source tension between he and his more taciturn friend, Gavrilo Princip (King and Woolmans, pg 177). While we tried as often as possible to use historically accurate quotes (with some artistic license for fitting the quote into 140-characters), we made an early decision that each character embody an overarching (even though sometimes fictional) “truthiness” instead of a purely biographical representation or controversially factual truth. Some characters represented whole factions of ideas or movements, as in the case of Serbian Chief of Intelligence Dragutin Dimitrijević and what we set up to be his Austro-Hungarian counterpart in General Conrad von Hötzendorf. Others, like the world leaders, represented the majority consensus of whole countries. Some of the quotes or sentiments we tried to express actually came from people never mentioned during the course of the project. Making a twitter account for each and every person involved in these events would have been highly impractical, so instead we used the account of a character that more than likely agreed with this person’s opinion. A good example of this is in the mini tweetenactment #IheartBosnia where @CommishGerde shares specific concerns about safety in Sarajevo — these concerns were actually voiced to Duchess Sophie on the night before the assassination by Dr. Josip Sunaric, vice president of the Bosnian diet (King and Woolmans, pg 194). While the mini tweetenactments were intended to introduce the main characters involved in these events and educate about their lives preceding June 28th, 1914, they had the additional benefit of inspiring volunteers to create their own characters and share new and often creatively unique perspectives. By the time of the LIVE Tweetenactment, community members had created Twitter accounts for Little Zophie, the Archduke’s daughter, her tutor Otto Lev Stanovsky, the chauffer for Archduke Ferdinand’s car in Sarajevo, and even the car itself. Occasionally audience members even heard from Austro-Hungarian Emperor Franz Joseph I’s beard. One of the most popular community-created characters was fictional pastry chef Dmitrije Stefanovic. Known as @KingofCevapi, Dmitrije personified that of the innocent bystander – just a man trying to make a living in Sarajevo as a Serb business owner while all of these events unfolded around him. It was this character that coined the phrase #franzophie, that became so popular in the Washington Post article about Duchess Sophie’s romance with Archduke Franz Ferdinand. In the weeks before June 28th, #KU_WWI staff turned over certain main characters to volunteers who would LIVE tweet the assassination. This gave the community members time to research their character and also pick up the tone of that character’s twitter account before the LIVE Tweetenactment. Each volunteer was asked to research, add, embellish, explain, retweet and respond – a significant commitment for those who were just volunteering. Each participant also had to reflect on how to be creative while still honoring the memory of the people involved in these events. Each had to decide where to draw the line between engaging audiences with creativity and educating audiences about the significance of this tragedy — a decision heavily influenced by their sincere and genuine interest in and enthusiasm for World War I history. On June 28th, LIVE Tweeters represented: @ArchdukeFranzi, @Duchess_Sophie, @GovPotiorek1914, @SarajevoMayor, @CommishGerde, @G_Princip1914, @N_Cabrinovic, @C_Popovic and they were joined by the community-made accounts @luckystift1911, @LeopoldLojka, @Little_Zophie, @Fr_Stanovsky, @Emperors_Beard, and @KingofCevapi. A big thank you to our LIVE tweeters who brought these characters to life! The Storify of their LIVE Tweetenactment will be posted on Monday, July 28th, 2014. Stay tuned! The #KU_WWI Twitter Project #IheartBosnia mini reenactment features an ensemble of characters and their activities in the months and days leading up to June 28th,1914. In Sarajevo, Archduke Franz Ferdinand (@ArchdukeFranzi) and Duchess Sophie (@Duchess_Sophie) arrive, exchanging telegrams with their children, visiting local tourist sites, and never knowing of the assassins stalking their every move (@G_Princip1914, @N_Cabrinovic). Governor Oskar Potiorek (@GovPotiorek1914) insists that the route of the imperial couple’s official visit be published in local newspapers, while fictional pastry chef Dmitrije Stefanovic (@KingofCevapi), who represents the many innocent bystanders of Sarajevo, complains incessantly about the needless fuss and pomp while going about his daily activities as a Serb business owner in Bosnia. Over in Belgrade, King Peter I of Serbia (@PeterI_Serbia) deals with an attempted coup while Serbian Chief of Intelligence Dragutin “Apis” Dimitrjević (@BlackHandApis) receives push back from fellow Black Hand members. Off in Germany, the British Navy arrives for the Kiel Regatta Gala, a celebration of the two country’s naval might, and an alarmingly prescient competition for what would come… (@PM_Asquith, @Wilhelm_II). While over in France, French President Raymond Poincaré (@Prez_Poincare) finally ends the political struggle over the three-year service law, pleasing their allies in Russia (@Tsar_NickyII). More cacophonous than any of the other #KU_WWI tweetenactments, #IheartBosnia features familiar as well as several new voices. Many of the tweets are direct quotes and all of the events actually happened — yes, including Archduke Franz Ferdinand getting bitten by a bear. The #KU_WWI #IheartBosnia English extended edition includes the full ensemble chorus as well as the delightfully creative additions of unknown voices from the twitterverse — members of the community chimed in with their own characters including unique perspectives from the Archduke’s car in Sarajevo (@luckystift1911) and that of Austro-Hungarian Emperor Franz Josef I’s beard (@Emperors_Beard). The #KU_WWI #IheartBosnia German edition focuses on an exchange Archduke Franz Ferdinand and Duchess Sophie had with Bosnian Governor Oskar Potiorek and Police Commissioner Dr. Edmond Gerde the day before their fateful visit to Sarajevo. Once again, the Archduke tried to cancel the visit while Governor Potiorek insisted on continuing as planned. Like the #All4USophie and #WhySarajevo transcripts, #IheartBosnia was translated into German by Lawrence-native Lea Greenberg, a recent graduate from Grinnell College. All combined, the #IheartBosnia tweetenactment introduces readers to the creative and compelling, humanities-driven exploration of the Archduke’s assassination featured in the LIVE tweetenactment on June 28th. Interested in following the #KU_WWI Tweetenactment of the assassination of Archduke Franz Ferdinand but don’t have access to Twitter? No problem! You can still watch the reenactment online. 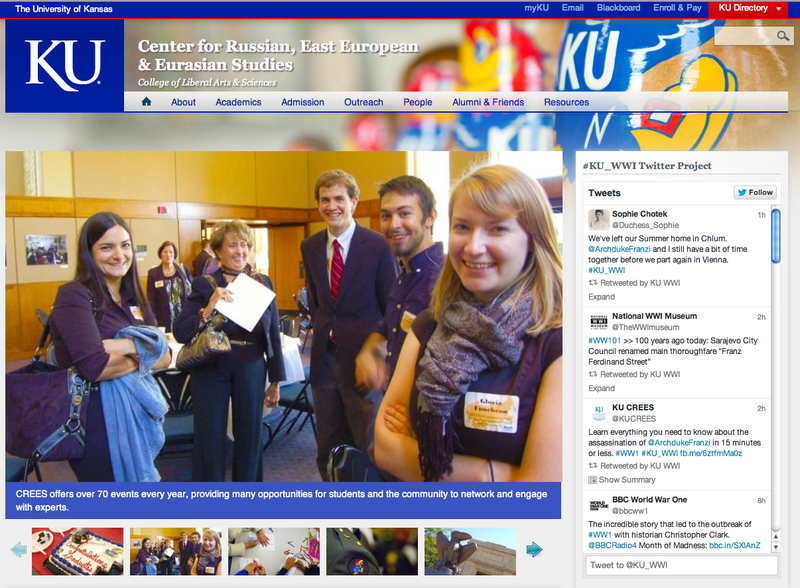 #KU_WWI twitter feeds are now embedded on the CREES and European Studies websites. Go to one of these websites and look for the right sidebar. Follow the action as the tweetenactment unfolds from 9:30am – 12:30pm on Saturday, June 28th. In the first of several promotional mini reenactments leading up to the reenactment of the assassination of Archduke Franz Ferdinand on June 28th, 2014, #SafetyFirst featured an exchange between Governor of Bosnia Oskar Potiorek and Sarajevo Police Commissioner Dr. Edmond Gerde as they discussed the Archduke’s visit. 24 May 2014. In #Conspiracy, assassin Gavrilo Princip and his friend Nedeljko Čabrinović discuss the plot to kill Archduke Franz Ferdinand with fellow co-conspirator Trifko Grabež and leader of the Black Hand terrorist group and Serbian Chief of Intelligence Dragutin “Apis” Dimitrjević. 28 May 2014. #WhySarajevo mini reenactment features a dialog between Archduke Franz Ferdinand and Austro-Hungarian Emperor Franz Josef I about the Archduke’s visit to Bosnia in late June 1914. 7 June 2014. In #All4USophie, Archduke Franz Ferdinand and Duchess Sophie Chotek discuss their life, love, and plans for celebrating their upcoming fourteenth wedding anniversary in Sarajevo. 19 June 2014. ​Chief of the General Staff of the armed forces of the Austro-Hungarian army advocates for war against Serbia which Archduke Franz Ferdinand strongly opposes. In the end, who was responsible for this decision? 20 June 2014. In the #KU_WWI Twitter Project‘s #BlankCheck mini reenactment, @GenHotzendorf tweets about war with Serbia 25 different times. These tweets represent the 25 official requests made by Count Franz Xaver Josef Graf Conrad von Hötzendorf, Chief of the General Staff of the armed forces of the Austro-Hungarian army, for a preventative war against Serbia between January 1, 2013 and June 1, 2014. In 1906, Archduke Franz Ferdinand strongly advocated for General Hötzendorf’s promotion to Chief of the General Staff of the Austro-Hungarian army, and for this reason public opinion often assumed the two shared militaristic views. But the reality was that General Hötzendorf’s obsession with a preventative war against Serbia was a major source of tension between the two. In General Hötzendorf’s mind, a war with Serbia and/or Russia was vital for the protection of the Austro-Hungarian monarchy. From Archduke Ferdinand’s perspective, the very idea was lunacy and would lead to immeasurable, unforeseen European destruction. The tweet responses made by @ArchdukeFranzi in the #BlankCheck mini reenactment are direct quotes Archduke Franz Ferdinand made to various contemporaries about General Hötzendorf’s advocacy for war (see Greg King and Sue Woolman’s The Assassination of the Archduke, pg 158-162). Public commentary made by @KingofCevapi Dmitrije Stefanovic, a fictional baker in Sarajevo, reflects the tone of public opinion as leaders hashed out the ideas and views that would eventually lead to the first world war. Historical narratives about World War I often focus on assigning blame. Who was responsible for the death of 15 million people? Some historians accuse Germany and its issuance of a “blank check” for war. Even more point the accusatory historical finger at Serbia and its support of the assassins who shot Archduke Franz Ferdinand. But the #KU_WWI Twitter Project wonders…when it comes to such utter devastation, can one person, country, event, or decision every be singularly responsible? The #BlankCheck mini reenactment is representative of the idea that many were to blame — aggressive nationalist groups existed throughout Europe as did the political leaders who supported and opposed them, and this was just one of many reasons that led to such a war. The #KU_WWI Twitter Project mini reenactment #All4USophie features an exchange between heir to the Austro-Hungarian empire, Archduke Franz Ferdinand, and his wife Duchess of Hohenberg Sophie Chotek. Considered by many of his contemporaries to be brusque, ill-natured and bad tempered, Archduke Franz Ferdinand was also known for one of the greatest romances of the 20th century. In 1900, much to the scandal of Viennese society and the Austro-Hungarian imperial court, Archduke Franz Ferdinand married Sophie Chotek, a lady-in-waiting with no fortune and what many considered inferior connections. The couple had been secretly courting since meeting at a ball in 1894, and their love affair shocked the royal families of Europe. Austro-Hungarian Emperor Franz Josef I was so against the marriage that it took intervention from Pope Leo XIII, German Kaiser Wilhelm II, and Russian Tsar Nicholas II before he’d allow it to take place, and even then only with certain conditions. In order to marry, the couple accepted their marital classification as morganatic, meaning that Sophie would never be afforded the rights and privileges as usually befits the wife of the heir to the throne, and any children born of the marriage would not inherit privileges or titles. Their eldest son Max would never inherit the throne, and he and his siblings, Sophie and Ernst, would never be accepted as equals by the imperial court. Even after signing an official, legally binding document renouncing his children’s right to the throne, enduring 14 years of imperial protocol and social slights designed to embarrass the couple, and publicly embracing his nephew as his future heir, many still suspected that Archduke Franz Ferdinand would go back on his word and crown his wife upon accession to the throne. For this as well as his various political views, Archduke Franz Ferdinand was unpopular garnering little public sentiment or support. #All4USophie was translated into German by Lawrence-native Lea Greenberg who recently graduated with a major in German and concentration in Russian and East European Studies from Grinnell College. Lea also translated the #WhySarajevo mini reenactment.